A blast from the past - my first Half Ironman in Augusta 2010. As the name implies, it is half the distance I will be doing in August at Ironman Canada. 1) HEAT - it's going to be a really hot day and I have had very few truly hot training days. Heat can absolutely wreck your day, particularly when you are not acclimated. 2) HILLS - This is quite a bit hillier half than I have done in the past. 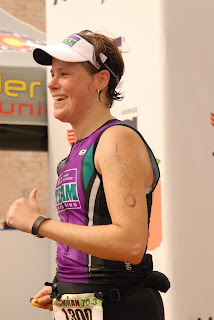 I love the Augusta Half Ironman but it is truly one of the easiest half ironmans you can do. My best time at those races has been around 6:30. It will take me likely 30 minutes longer to do this race. The best I can do is look at this as a long, hot training day. I want to just be happy with my nutrition plan and fitness coming out of the day. So I'm hoping for a 7 hour race - I will give you the full report after this weekend and maybe share a picture or two from the weekend.